Garstang followed up their midweek defeat at AFC Liverpool with another loss as they went down 2-1 at Ashton Town. Lee Baker was without the injured Shaun Sailor and the unavailable Tom Entwisle. However, he was able to name Jake Salisbury and Jack Swindlehurst in the squad with Jack Bennett recalled alongside Tom Graham in the centre of midfield. Garstang played down the hill in the opening 45 minutes but it offered them little advantage. Ashton’s forwards looked dangerous from the kick-off and they should have taken the lead after just two minutes but the ball was headed wide with the goal gaping. They took the lead after just 10 minutes when a diagonal cross cleared Josh Westwood’s head and Woods scored from close range. However, Garstang were soon back in the game a minute later when a free-kick 25 yards out saw Tom Graham send a curling shot around the wall and into the goal. Will Kitchen made a fantastic save to keep Garstang on level terms before Ashton missed another gilt-edged chance from close range. Garstang looked better going forward with Alan Coar volleying just wide before he, along with brother Ric, had their efforts blocked on the line. A dubious offside decision ruled out a Ric Coar header, meaning the score was 1-1 at half-time. The second half was played in a similar vein to the first with both sides looking better in attack than defence. 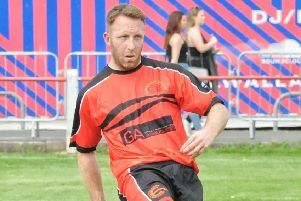 The first clear chance fell to Garstang when Alan Coar controlled Kitchen’s long clearance before laying the ball into the path of Jonny Hothersall, who crashed a shot from 25 yards against the underside of the bar. The game became more frenetic with last-gasp blocks from both defences keeping the score level before Salisbury fired over from 25 yards. At the other end, Woods’ close-range effort went high and wide but, with five minutes left, Ashton scored the winner when Kitchen saved an attempt, only for John Edgerton to turn in the rebound.